So, Shri Narendra Modi came to Bengaluru. The roads were all decked up—there were plastic orange buntings swooping down from the lamp posts, winding through the pavement railings, then swooping up again to the lamp posts, making it look like the lamp posts had all linked their hands to form a personal security cordon for him. So sweet. There were huge circular cutouts of the revered leader’s face, with orange rays radiating outwards, so he looked like a hirsute, benign sun—there were hoardings of all his faithful underlings, about forty grinning faces per hoarding, neatly arranged liked chocolate cupcakes on a baking tray. It was all very affecting. I was on the road, heading for the Bangalore Literature Festival at the Jayamahal Palace hotel, so I got to see the bundobust first hand. The roads were absolutely deserted when I went through, but people who arrived later told me that it got completely clogged later. In fact, there were traffic snarls and irate citizens everywhere—all signs that the rally was a resounding success. A bunch of cheeky, smiling youngsters, wearing college graduate degree robes, and selling pakoras (like Modi-ka Pakoda, ‘Shah’i Pakoda)—a dig at the prime minister’s ‘pakora-sellers are also employed’ statements—were shooed away from the venue by the cops. The speech—bookended with Kannada, but delivered in Hindi—with no translation on offer for the listening crowd of two lakh locals—was mostly a rant against the incumbent Congress government. 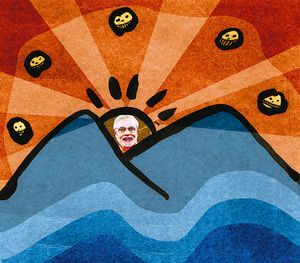 ‘It’s a 10 per cent ki sarkaar,’ the prime minister charged, ‘no work gets done without 10 per cent commission!’ An excitingly worded sentence—‘scams aur mafia ka nanga naach’ or ‘naked dance of scams and mafia’—created a tepid, titillated stir. But, there was no mention of the Mahadayi waters issue, where Karnataka is locked in a tussle with Goa over share of water from the Mahadayi aka Mandovi river, so that water can be provided for the four drought-hit districts in north Karnataka. And, that is what the crowd was really keen to hear about. Basically, the WIFY quotient—an old advertising jargon which stands for ‘what’s in it for me?’—was substantially missing. On February 10, Rahul Gandhi is coming to town for his rally. I am hoping the orange buntings will still be up—the Congress Party workers could just add a few touches of green and white, and recycle them—and, so, save our drains from being choked with masses of plastic later. It is being reported that Rahul will continue his temple run on his tour of Karnataka, maybe even the Shree Subramanya Temple in Sullia, which demands all male members take off their shirts, vests and coats, and approach the deity bare-chested. Naturally, all of Dakshina Kannada is agog! (Could this be the nanga naach Modiji was talking about?) I saw in an interview somewhere that Rahul does a decent amount of gymming, so hopefully, that should make for a pleasant, vote-garnering sight. Aaah, what days for us, here in Karnataka! We have never felt so wooed. There is free food on offer for those who show up at the rallies and shout whenever they are told to. And, the bus ride, too, is fun! If your tummy or bladder starts to burst from all that feasting, you can always jump out of the bus and relieve yourself in the open—so what if you break Akshay Kumar’s Swachh Bharati heart? And, even if the promised food doesn’t show up, you can still take home the massive flex posters of the great leaders as your booty—they make for great water-proofing for cow sheds and huts. Amit Shah’s chubby, beaming face, soaking up the rain, keeping a cow and her calf from getting wet—so fitting, no?